A watercolor fantasyland? No. It's actually an image of the center of the Omega Nebula, a hotbed of newly born stars wrapped in colorful blankets of glowing gas and cradled in an enormous cold, dark hydrogen cloud. This stunning picture was taken by the newly installed Advanced Camera for Surveys (ACS) aboard NASA's Hubble Space Telescope. 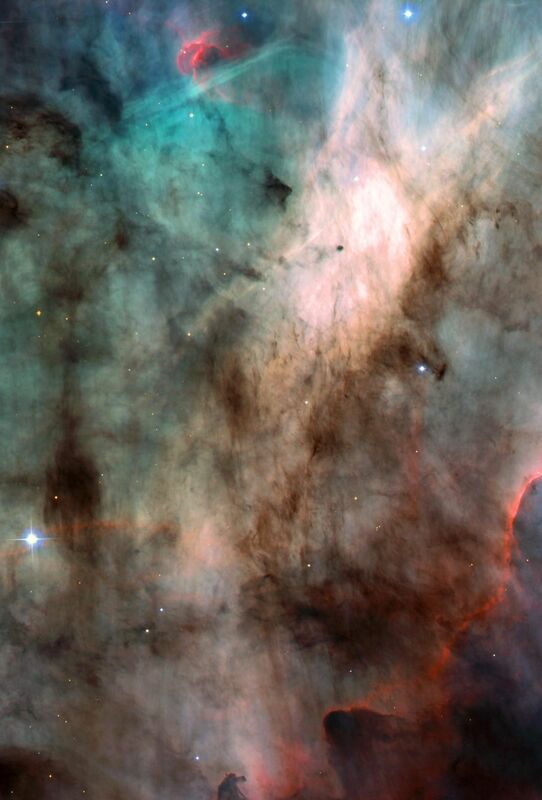 The region of the nebula shown in this photograph is about 3,500 times wider than our solar system. The area represents about 60 percent of the total view captured by ACS. The nebula, also called M17 and the Swan Nebula, resides 5,500 light-years away in the constellation Sagittarius. Like its famous cousin in Orion, the Swan Nebula is illuminated by ultraviolet radiation from young, massive stars, located just beyond the upper right corner of the image. Each star is about six times hotter and 30 times more massive than the Sun. The powerful radiation from these stars evaporates and erodes the dense cloud of cold gas within which the stars formed. The blistered walls of the hollow cloud shine primarily in the blue, green, and red light emitted by excited atoms of hydrogen, nitrogen, oxygen, and sulfur. 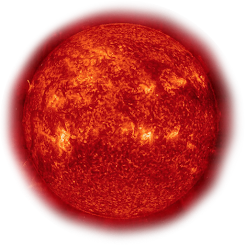 Particularly striking is the rose-like feature, seen to the right of center, which glows in the red light emitted by hydrogen and sulfur. As the infant stars evaporate the surrounding cloud, they expose dense pockets of gas that may contain developing stars. Because these dense pockets are more resistant to the withering radiation than the surrounding cloud, they appear as sculptures in the walls of the cloud or as isolated islands in a sea of glowing gas. One isolated pocket is seen at the center of the brightest region of the nebula and is about 10 times larger than our solar system. Other dense pockets of gas have formed the remarkable feature jutting inward from the left edge of the image, which resembles the famous Horsehead Nebula in Orion.